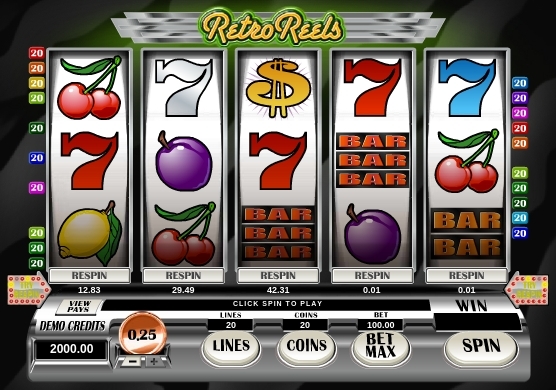 Retro in design but modern in concept – this is the brilliant idea behind Retro Reels, a Microgaming video slot game that combines the feel of the classic three-slot games with the look of the modern five-slot games popular in online casinos. Many aspects of the slot game are designed like the classic slot game, such as the 3D panels for the controls, the fruit symbols (e.g., Plum, Cherry, and Lemon), and the bold and bright colors with the addition of other symbols, such as the single, double and triple Bars. New players are well advised to read the rules about Respin. In other instances, players will find that Retro Reels is easy to play especially with the in-lay instructions and messages. The retro inspiration for Retro Reels has been put into excellent use. All of the symbols as well as the background have excellent thematic values while the overall layout makes it a joy to play for hours on end. The graphics are done in vivid colors with good attention to detail. The downside: There is a notable absence of animation for the symbols during winning combinations. Perhaps the designers can make the animation more animated to encourage modern-day players to come and enjoy the game. The range of coin denominations is 0.01, 0.02, 0.05, 0.10, 0.20 and 0.25 so the maximum total bet for every spin is $100.00 – truly, a range that high rollers will find attractive. Players can bet up to 20 coins in each payline, of which there are 20 total paylines. With this range, players have the benefit of a maximum line bet of 20 coins while the maximum total bet amounts to 400 coins. When converted to credits, 20 coins equal 5.00 and 200 coins equal 100.00. • Two or more scatter (Free Spins logo) symbols trigger scatter payouts, which come in two forms. First, the free spins are activated with a maximum of 25 free spins. Second, the coins payout is provided with the maximum payout set at 100 for five scatter symbols. All payouts during the free spins can be doubled. The lucky player will be awarded 100,000 credits as jackpot payout during the free spin rounds. • Respin feature allows a player to re-spin any of the reels but with an extra cost, which means an increased chance for winning the jackpot. Look at the re-spin costs displayed as credits below each of the reel with each cost being variable (i.e., depends on the probability of payouts in case the reel is re-spun). The maximum jackpot prize of 100,000 credits is one of the highest in the industry. Modern-day players will find certain drawbacks to the game, such as the absence of a wild symbol to substitute for the other symbols in forming winning combinations and the absence of animation on the reels. Overall, nonetheless, Retro Reels will make for a good time at the slots.